Since we entered into a partnership with RS Components the Zerynth toolset has been available for download on the DesignSpark engineering community. This allows the members of the community to easily access our innovative IoT programming tools. So, we thought that it would be useful and helpful to add a small tutorial on how to uplink a Python script on your microcontroller using DesignSpark Zerynth Studio. 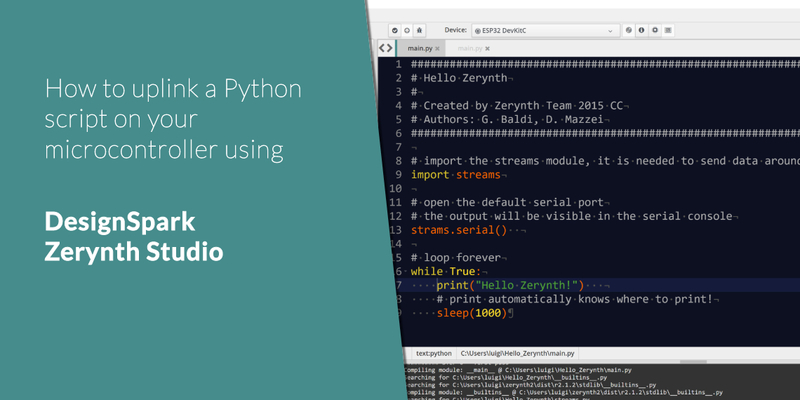 We’ll assume that you already installed Zerynth Studio, “virtualized” your board and created a new project, so let’s jump right into the tutorial. If you take a look at the image below, you’ll see buttons on the upper left toolbar. They allow you to verify and uplink a script into a device. To verify a project click on the Verify icon to check your script for errors. The errors will be reported in the console and in the code editor with helpful tooltips. To Uplink your verified project into a Virtualized device just click the Uplink icon and follow the Zerynth Studio messages. We hope this tutorial was helpful, and that you are already working on your Zerynth project.